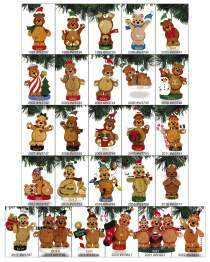 Christmas Bear Ornaments are companion projects to the Christmas Bear "Shelf Sitters". They are a great gift to make and give to someone for Christmas - or make it for yourself! They are a smaller versions of each of the Christmas Bears but are designed to hang on your tree rather than sit on a shelf! They measures approximately between 3-1/2" to 6-1/2" tall. Make them out of 3/8" stock, a piece of 1/8" oak for the overlays (one piece of 12" oak is enough to make overlays for up to 3 ornaments), and for the #W3754 ornament order 5 wood light bulbs and some wire.